Michael G. Bush is well known to Monkees fans as he photographed the group's concert tours in the 1980s and 1990s. Michael has enjoyed a long career in photography since the late 1970s, and has shot superstars like The Rolling Stones, Elton John, Queen, The Who, The Bee Gees, Marvin Gaye, Bob Dylan, Rod Stewart, Stevie Wonder, Santana, James Brown, Paul McCartney, and David Bowie. He also organized the 1988 Monkees convention in Chicago, Illinois. On a personal note, I used to anticipate Michael's catalogs and flyers announcing his latest photos of The Monkees, most of which came with an update about the activities of the group at the time. In this August 1988 interview with Paris Stachtiaris on the Headquarters radio program, Michael discusses his photography career, the schedule for the '88 Chicago convention, how he became involved with The Monkees, fellow photographer Henry Diltz, and more. Also during this episode, you'll hear some live audio from The Monkees' 1987 summer tour and great sound bites courtesy of Davy Jones. Best known to fans of The Monkees' TV series as "Junior Pinter" from the first season episode, "Captain Crocodile," actor Joey Baio also appeared in television shows such as The Edge of Night, The Doctors, and The Hero in the 1960s. The cousin of Scott Baio (Happy Days, Charles in Charge), he had worked with Davy Jones before The Monkees as a cast member of Oliver!, eventually taking the role of The Artful Dodger, the character that Davy played and had been nominated for a Tony Award in 1963. In this 1989 interview with Paris Stachtiaris and John Di Maio on the Headquarters radio program, Baio discusses his early career jobs, working with Davy during his Oliver! days, appearing on The Monkees, and more. Davy's 1987 autobiography highlighted on special episode of "Headquarters"
This episode of Headquarters is centered around Davy Jones and his 1987 autobiography, They Made a Monkee Out of Me. The special, hosted by Paris Stachtiaris and John Di Maio, begins with a multi-part interview with Alan Green, who assisted Davy in the publication of the book (as well as 1992's Mutant Monkees Meet The Masters of the Multimedia Manipulation Machine!). Green was also a member of Toast, the late '70s/early '80s group that backed Davy on the road during that period. Green talks about his relationship with Davy and the genesis of their partnership, Basil Foster, and recalls Toast on tour. From there Paris and John speak with Davy about the book, his experiences on Broadway, The Monkees' fallout with MTV, Pool It!, the making of the "Every Step of the Way" video, 33 1/3 Revolutions Per Monkee, his 1988 solo album Incredible, Don Kirshner, Colpix Records, Head, and much, much more. Please note that I've misplaced the opening of this episode of Headquarters which is why the program begins right away with Alan Green's interview. And, sprinkled throughout you'll hear two tracks from Incredible, "After Your Heart" and "Hippy Hippy Shake," along with "Rainbows" (written and recorded with Chip Douglas), as well as audio from Davy's late 1965 appearance on Ben Casey. Kelly Jean Peters guest starred in one of the most fondly remembered episodes of The Monkees when she appeared as Fern in "Too Many Girls" during the show's first season. In this airing of the Headquarters radio program from 1990, Peters talks about working with The Monkees, Reta Shaw (who also co-starred in "Too Many Girls"), her acting career, as well as her role alongside Dustin Hoffman in Little Big Man. Butch Patrick appears on "Headquarters"
​In this late 1987 interview with Paris Stachtiaris on The Monkees Hour, Butch recalls his career in show business, working with The Monkees, and more. The show also features a live version of "Can You Dig It" from the '87 summer tour. Singer-songwriter Diane Hildebrand co-wrote some of The Monkees' most well-known songs. "Early Morning Blues and Greens" and "Your Auntie Grizelda" were composed by both Diane and Jack Keller. "Goin' Down," largely considered a Monkees classic, is a collaboration between the band and Diane. She released an album for Elektra Records in 1967, and continued writing songs throughout the 1970s. In 1968, Hildebrand contributed to Monkees Monthly in an article entitled "The Monkees Never Relax." In these late 1989 episodes of the Headquarters radio program, Diane speaks with hosts Paris Stachtiaris and John Di Maio about her career in music, her relationship with The Monkees and the songs she wrote for the group, and much more. ​Jeff Barry is an award-winning songwriter and record producer. Among the most successful songs that he has co-written are "Da Doo Ron Ron," "Then He Kissed Me," "Be My Baby," "Chapel of Love," and "River Deep - Mountain High" (all composed with his then-wife Ellie Greenwich and Phil Spector); "Leader of the Pack" (written with Greenwich and Shadow Morton); and "Sugar, Sugar" (written with Andy Kim). In the 1960s, Barry would partner, both professionally and personally, with Ellie Greenwich to form one of the decade's most prolific songwriting and producing teams. By 1966, he was part of Don Kirshner's Brill Building team. Barry produced a plethora of tracks on The Monkees' second LP, More of the Monkees, along with their most successful single, "I'm a Believer," and its follow-up, "A Little Bit Me, A Little Bit You." After The Monkees seized control of their musical output in early 1967, Barry wouldn't participate in a Monkees recording session until 1970 when he produced the group's final album, Changes, recorded with Micky Dolenz and Davy Jones. The album included numerous songs written by Barry like "Oh My My," "Ticket on a Ferry Ride," "Do You Feel It Too?," and "Tell Me Love." In this 1990 interview with Paris Stachtiaris and John Di Maio on the Headquarters radio program, Barry talks about his career in the music business, working with The Monkees, and his relationship with Michael Nesmith. Micky's sister, Coco, has a long history with The Monkees. She provided harmony and background vocals on such Monkees tracks as "Shortly Blackwell," "Little Girl," "Midnight Train," and "Mommy and Daddy." She wrote for teen magazines in the 1960s at the height of her brother's fame, and in the late 1970s, she toured with Micky and Davy after the dissolution of Dolenz, Jones, Boyce & Hart. In 1987, Coco released her own album, One Voice. She joined The Monkees onstage in a supporting role when Michael, Micky, and Peter reunited in late 2012 for a series of concerts after the passing of Davy Jones. When not touring with The Monkees, you can hear Coco at Micky's solo shows, where she often duets with her brother on "Bye Bye Blackbird" and "Crying in the Rain" while taking over on lead vocals for Michael Nesmith's own "Different Drum." In this 1989 interview with Paris Stachtiaris and guest host Valerie Lionel on the Headquarters radio program, Coco talks about experiencing Monkeemania in the '60s, growing up with Micky, working with Micky and Davy (and The Laughing Dogs) on the road in 1977, and much more. You'll also get to hear tracks from her 1987 album One Voice and The Coasters' version of "D.W. Washburn." ﻿Bobby Hart appears on "The Monkees Hour"
Along with his songwriting partner Tommy Boyce, Bobby Hart is responsible for penning some of The Monkees' most enduring songs, including "Last Train to Clarksville," "Steppin' Stone," and "Valleri." Arriving with determination and drive to the nascent Monkees project, the duo wrote and produced the soundtrack to the pilot episode, including singing the lead vocals, which were later replaced once the show was formally cast with Micky, Davy, Michael, and Peter. Despite conflicts with Don Kirshner, the show's music supervisor, Boyce and Hart were retained, and with the help of their backing band, The Candy Store Prophets, Boyce & Hart went on to produce many of the early Monkees recording sessions. Their influence eventually waned once Kirshner was sacked and The Monkees gained control over their musical output in early 1967. However, each original Monkees album, except Head, contains Boyce & Hart tunes. Tommy and Bobby went on to have a successful recording career on their own, making guest appearances on television shows and contributing scores to movie soundtracks. In the mid-1970s, they teamed up with Micky Dolenz and Davy Jones, a project which lead to concert tours, new music, and a television special. Boyce & Hart have been celebrated recently with a full-length documentary (co-produced by Monkees archivist Andrew Sandoval), and earlier this year, Bobby published his autobiography. In this interview from 1987 on The Monkees Hour, hosts Paris Stachtiaris and John Di Maio speak with Bobby about a wide range of subjects, including songwriting, how he met Tommy Boyce, his thoughts on not being selected as one of The Monkees, his relationship with Don Kirshner, the track "Long Way Home" from the Pool It! LP, and much more. You'll also hear Tommy and Bobby's version of "I Wanna Be Free" and their 1968 Top 10 hit "I Wonder What She's Doing Tonight." Gary Strobl is a longtime Monkees collector and confidant of the group. Fans will remember his efforts in organizing Monkees conventions and, for a brief time in the '80s, his contributions to the publication Monkees West. Gary has been compiling a book on The Monkees since 1983, conducting research and amassing numerous amounts of interviews through the years. Strobl, in collaboration with Henry Diltz and Harvey and Kenneth Kubernik, previously announced that a deal had been signed to publish their work. In this June 1988 interview on the Headquarters radio program, Gary speaks with hosts Paris Stachtiaris and John Di Maio about how he became a Monkees fan and reveals intricacies behind the work on his book. Ed Reilly is a first generation Monkees fan, collector, and author who co-published one of the principal books about The Monkees during the group's 1980s revival. Ed is also known for his long running column in (the now defunct) Monkee Business Fanzine. Entitled "Star Collector," Ed would break down a wide range of Monkees memorabilia, including everything from toys, trading cards, records, and much more. In 1987, The Monkees - A Manufactured Image: The Ultimate Reference Guide to Monkee Memories & Memorabilia, was published. Its authors included Reilly; the editor-in-chief of Monkee Business Fanzine, Maggie McManus; and longtime Monkees associate Bill Chadwick. The year before, Ed co-produced the 1986 Philadelphia Monkees convention. In this 1988 interview with Paris Stachtiaris on the Headquarters radio program, Reilly talks about how he became a fan, the genesis of the Manufactured Image book, and his tips on collecting Monkees memorabilia. Ed has also been kind enough to share pieces from his collection with the Live Almanac, including the original album cover art for the 1969 Greatest Hits LP, the rare fan club postcard promoting the release of "Oh My My," and more. It was a pleasure to be able to say hello to him at concerts during the 2011 and 2012 Monkees tours. John "Jackie" Cooper, Jr. was an actor, television director, producer, and executive. As a child star, he was the youngest performer to have been nominated for an Academy Award for Best Actor in a Leading Role (at age 9 for the film Skippy in 1931). As an adult, Cooper transitioned from child actor into a figure that experienced a long and storied career in Hollywood. From 1964 to 1969, Cooper was vice president of program development at Columbia Pictures Screen Gems television division. He was responsible for developing shows (such as Bewitched) and selling them to the networks. In April 1965, Bob Rafelson and Bert Schneider received $225,000 from Cooper after forming Raybert Productions, the new company that had created the concept for what would become The Monkees television series. With that start-up money, Raybert was able to begin the audition process that eventually led to the selection of Micky Dolenz, Davy Jones, Michael Nesmith, and Peter Tork. In this 1989 interview with Paris Stachtiaris on the Headquarters radio program, Cooper recalls the triumphs and challenges of his years in Hollywood, and discusses his involvement with the Monkees project. Vito Scotti was an Italian American character actor who played many roles, primarily from the late 1930s to the mid-1990s on Broadway, films, and television. He was known as a man of a thousand faces, for his ability to assume so many divergent roles in more than 200 screen appearances, in a career spanning 50 years. Vito appeared in "The Case of the Missing Monkee" during the first season of The Monkees, and later in The Monkees' 1968 feature film, Head. In this late 1989 interview with Paris Stachtiaris on the Headquarters radio program, Vito talks about his acting career and his experiences working with The Monkees. The Candy Store Prophets were a band headed by Monkees songwriters/producers Tommy Boyce and Bobby Hart. Their lineup included Boyce and Gerry McGee on guitar, Hart on keyboards, Larry Taylor on bass, and Billy Lewis on drums. During the summer of 1966, The Candy Store Prophets recorded the majority of the backing tracks for the first Monkees album, with assistance from guitarists Louie Shelton and Wayne Erwin. Lewis played drums on several key Monkees songs (in the days before the group supported themselves instrumentally in the studio). That's Billy you hear on "Last Train to Clarksville," "Steppin' Stone," "She," "Saturday's Child," and "(Theme from) The Monkees," along with a host of others. When The Monkees began their first live concert appearances in late 1966, the Prophets toured with them as their opening act while also backing the individual Monkees during their solo spots. In this 1988 interview with Paris Stachtiaris and John Di Maio on The Monkees Hour, Billy recalls working in the studio with Don Kirshner, touring with The Monkees, recording with Boyce and Hart, and more. The Characters are a rock band that formed in New Jersey in 1982. Monkees fans will recall that the group performed at Monkees conventions in the mid-1980s in Illinois, California, and New Jersey. They also made a cameo in the 1987 "Heart and Soul" music video. The Characters are scheduled to appear at Micky's upcoming solo show in Ridgefield, Connecticut at The Ridgefield Playhouse on Friday, August 1. 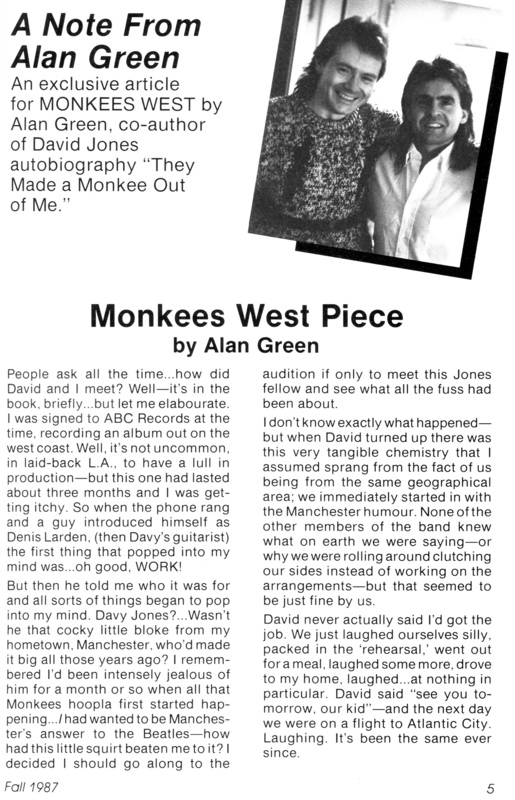 In this interview with Characters lead singer and rhythm guitarist (and longtime Monkees fan) Danny Solazzi from The Monkees Hour in 1987, Danny talks about the origins of The Characters, his interactions with The Monkees in the mid-1980s, recording with Chip Douglas, and much more. You'll also get to hear a Characters song, "Maryann," and Danny's impression of Chip Douglas! Be sure to visit The Characters on the web. Monkee Business Fanzine was a quarterly publication that featured all the latest about The Monkees and their individual careers, as well as original articles, classified listings, and much more. It was published by editor Maggie McManus from 1977-2002. Each member of The Monkees would speak personally to Maggie, making it the most reputable source for Monkees information, before and after the 1986 revival of the group. By the early 2000s, the rise and rapid spread of the World Wide Web helped make publications like MBF become defunct. In this interview with Paris Stachtiaris and John Di Maio, Maggie talks about the birth of MBF, her assessment of The Monkees' legacy, the fractured relationship between the group and MTV that had occurred at the time of this 1987 interview, and more.